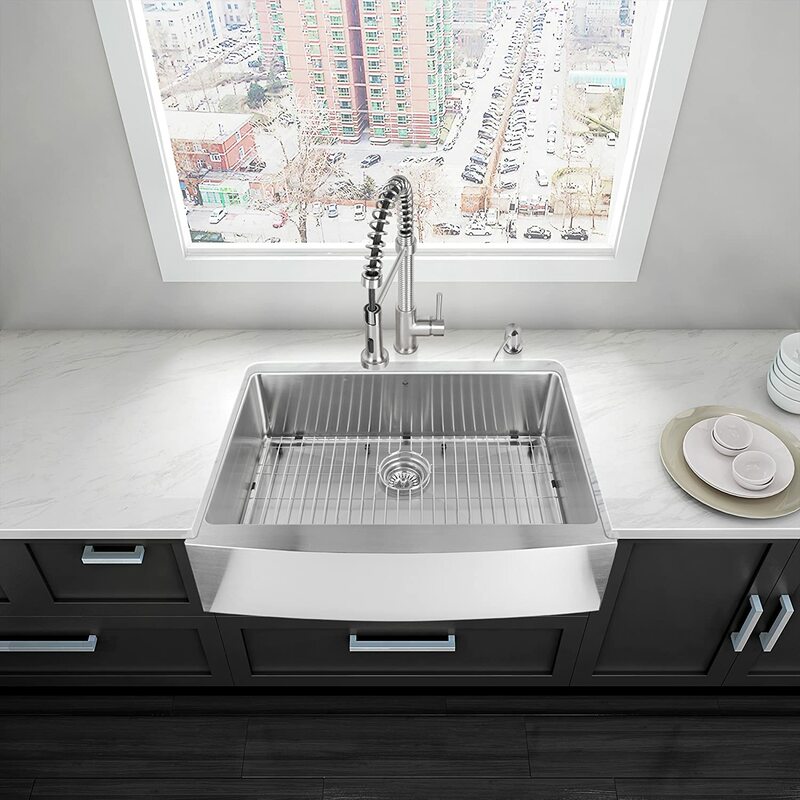 While there are a plethora of stainless steel sinks on the market, they are not all made equal. Things can be especially tricky when you’re on a budget, as although there are many options, it’s hard to find something that offers a great balance of looks and quality. But fret not, as we have done all the hard work for you and found the product that perfectly fits this criteria. So all you have to do now is read this review and decide whether the VIGO VGR3320C that we will be reviewing is exactly what you’re looking for or not. You may not be very familiar with the different grades of steel used to make stainless steel kitchen sinks, but anything made using 16 gauge steel is going to be very high quality and durable. While a large number of steel sinks are made using 16 gauge steel, it’s hard to find one in this price range, especially without compromising on the other important factors. So if the quality and durability is the most important factor for you – and you’re on a tight budget – you may not have many better options than the VIGO VGR3320C. There’s a reason the seller mentions this detail right in the title of its product page, and it’s that the size is one of the best things about the VIGO steel kitchen sink. 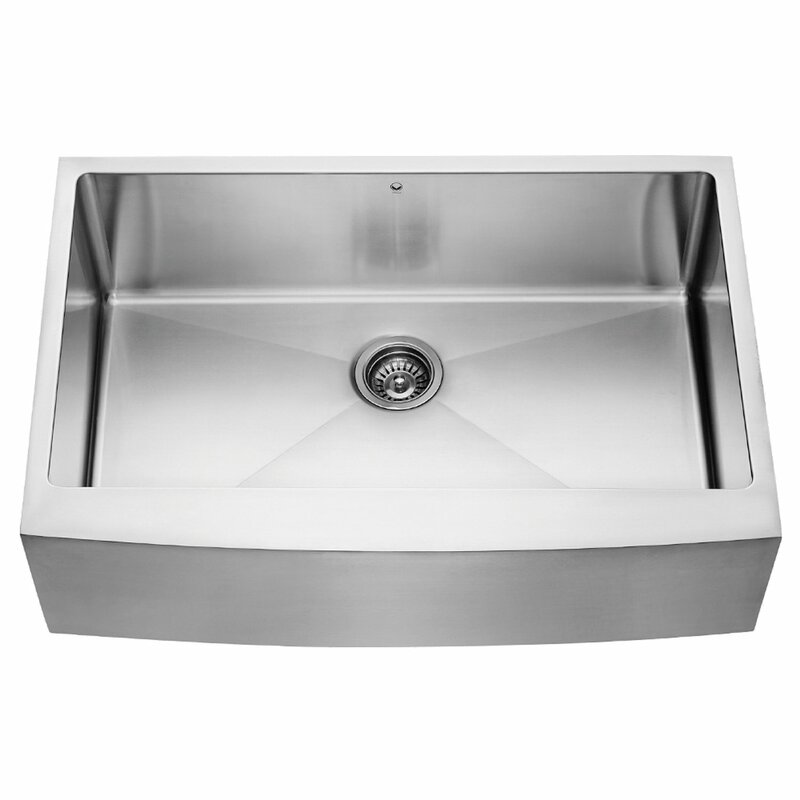 There’s probably no other stainless steel kitchen sink in this price range that’s as large as the VIGO VGR3320C. Customers have been mentioning in their reviews how they are being able to put pretty much everything they want, without having to worry about the sink space. To give you an idea of how spacious the sink area is, you can put a full-size cookie sheet in it and would still be left with enough space to accommodate a few bowls. While it’s now not rare to come across stainless steel sinks that come with sound-deadening pads even in this price range, the quality usually isn’t very impressive. You still do get some noise when using the sink, especially when washing a large or heavy object. However, the VIGO VGR3320C has its underside fully coated and padded. In fact, the padding is multi-layer, which is hard to come by in this price range. This means that you can definitely expect a superior level of sound elimination, and much quieter washing sessions than what most other steel sinks can offer in this price range. This sink comes in a premium-quality, commercial-grade satin finish, which is another surprising feature given the modest price point. 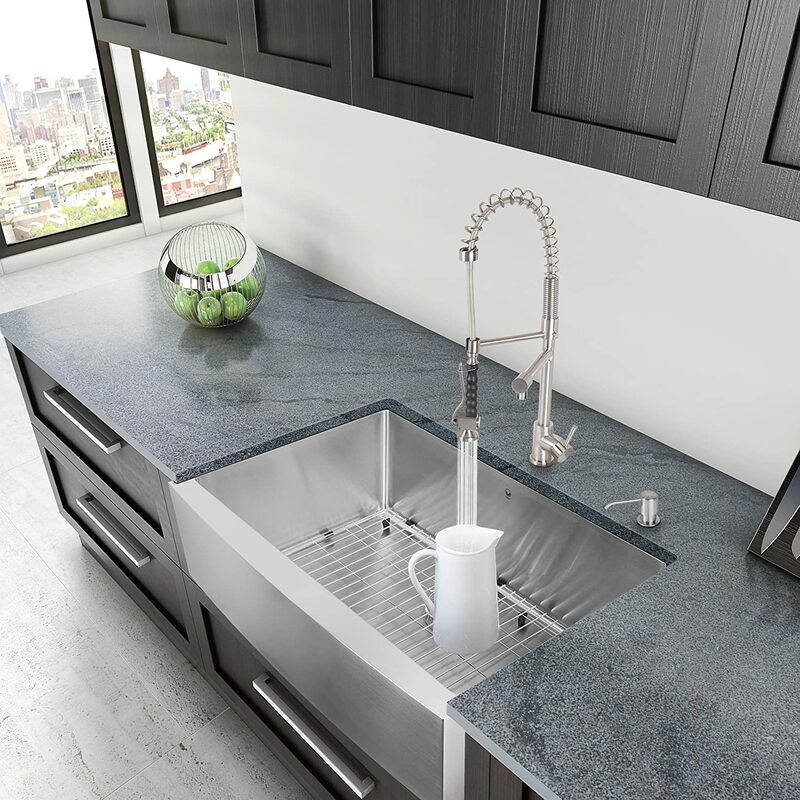 The finish not only greatly adds to the look and feel of the sink, but also ensures that the sink would never rust, which is a great guarantee to have when buying a steel kitchen sink. Now, let us first tell you that the VIGO VGR3320C isn’t the only steel sink that has an almost flat surface, but you need to be aware of it regardless. The thing is, a flat-ish surface means that the yukky leftover stuff wouldn’t get drained out by itself, and you may have to do some manual work to get rid of it. Similarly, the water can take a bit more time to flow through the sink than it would through a slightly curved surface. However, these issues are far from worrying, and at this price point, they definitely aren’t a deal-breaker in the slightest. Despite the couple minor issues, we have no hesitation in saying that you’re getting a great deal here. Features of VIGO VGR3320C such as 16 gauge steel, 33-inch size, multi-layer sound-deadening pads, satin finish and more, at a price where it’s hard to find half of these, is certainly not much short of a steal.